As we stroll into the Christmas season, there are lots of dinners out, parties, and family gatherings. And many of the meals revolve around meat; turkey dinners, holiday hams, steak restaurants, seafood feasts… the list seems endless. To avoid feeling weighed down this winter I’m adding more vegetarian meals into my repertoire. 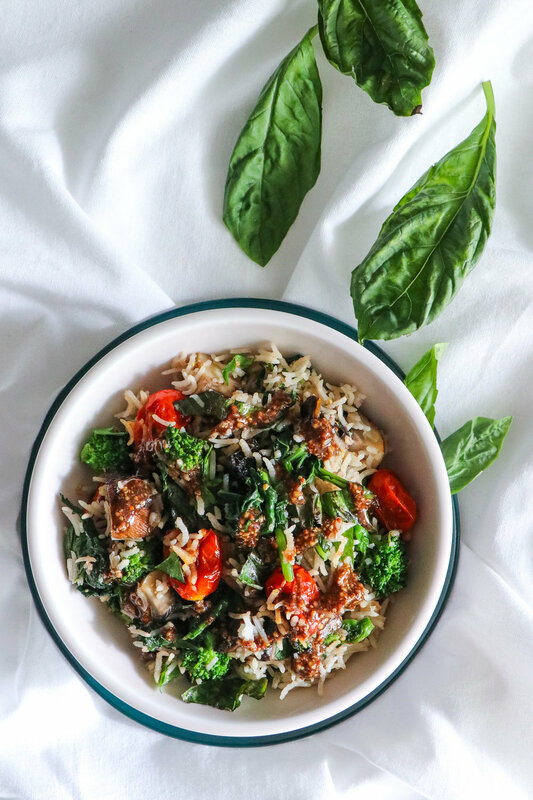 My Tomato, Rapini, and Portobello Rice dish is a flavorful, hearty, and healthy meal. Fuel your body with bright and energizing meals. You’ll need it to balance out all that wine! Preheat the oven to 400F and line a baking tray with parchment paper. Toss the whole mushroom and the tomatoes in about 1 - 2 tsp of olive oil. Spread them out on the pan and season with salt. Roast for 30 minutes. The tomatoes should be splintered and bubbling, and the mushroom should be juicy and caramelized on the bottom. While that’s roasting, roughly chop the rapini and wash thoroughly as it tends to be very sandy. Heat about 1 tsp of olive oil in a non-stick frying pan and sautee the rapini until it’s bright green and softened. Set aside. Cut the cooked mushroom into 1/2 inch cubes. Add the mushroom, tomatoes, rapini, herbs, and rice to a mixing bowl. Whisk together the mustard, remaining olive oil, balsamic, and salt (to taste) in a small bowl. Pour the dressing over the rice and veggies and toss well. Serve immediately.